A new way to "get out the vote"
COLUMBIA, Mo 4/7/15 (Beat Byte) -- They've been the talk of the polls all day: large, comfortable, charter busses taking people to polls with "Vote For Dan Rader, First Ward City Council" signs boldly plastered across the windows. How can this be right? voters have been asking the Heart Beat. 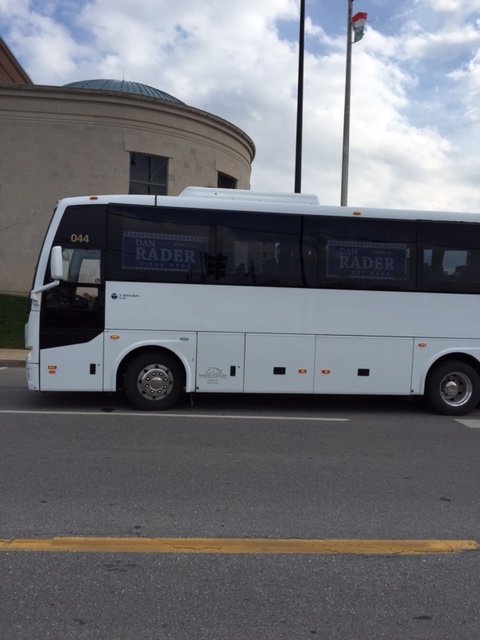 "I was appalled tonight walking to my car to see a bus with Rader's name plastered all over it delivering voters to the polls," a reader noted. "First of all, how is this legal? For a candidate to provide services like that, it seems to be a conflict of interest." Other readers said the busses were only for Rader-ites. "I got on one of these busses to vote for Jake Loft," a reader noted. "They were actually asking people to leave who weren't voting for Rader." A third person during a phone call today expressed similar outrage. "Seems like blatant electioneering to me." Rader was earlier taken to task for holding a voter registration drive at his family-owned Bengals Bar and Grill, reportedly offering free beer during the event. You are here: Home Politics Campaigns and Elections RADER BUSSES IRK READERS: "How can this be right?"